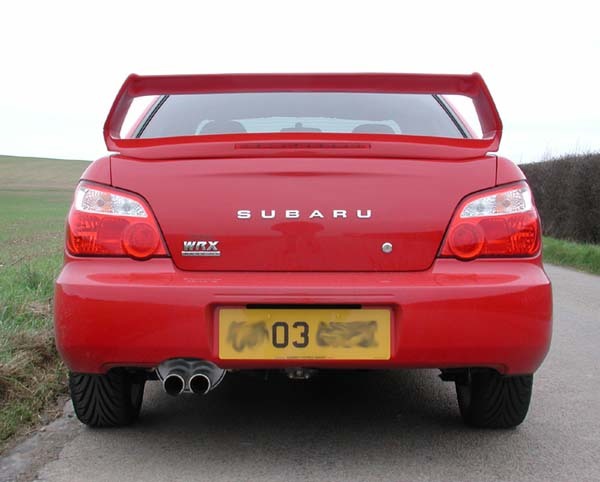 This was the first time I had seen in the flesh so to speak either the WRX or the WRX STi in its latest MY03 revision. I must say that in my opinion and in real life the MY03 facelift is far better than even the pictures portray. 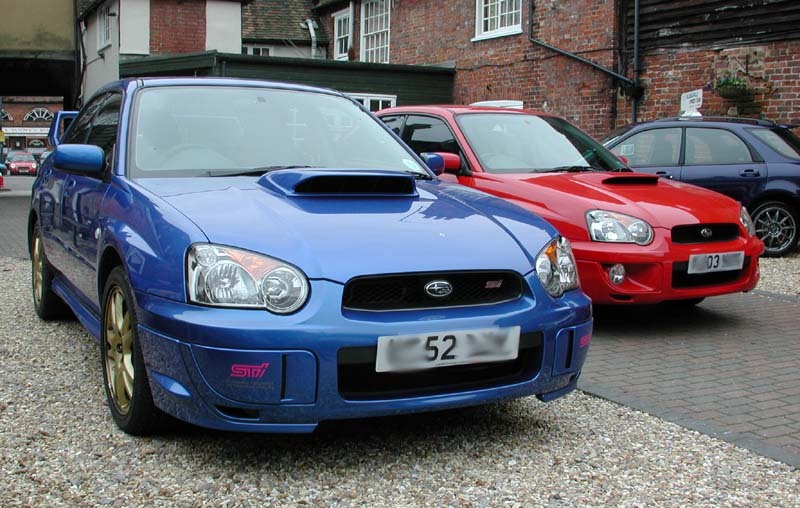 An MY01 Bugeye sitting alongside looked a bit strange in comparison.... and I was just getting used to its looks. 4 door and 5 door WRX. 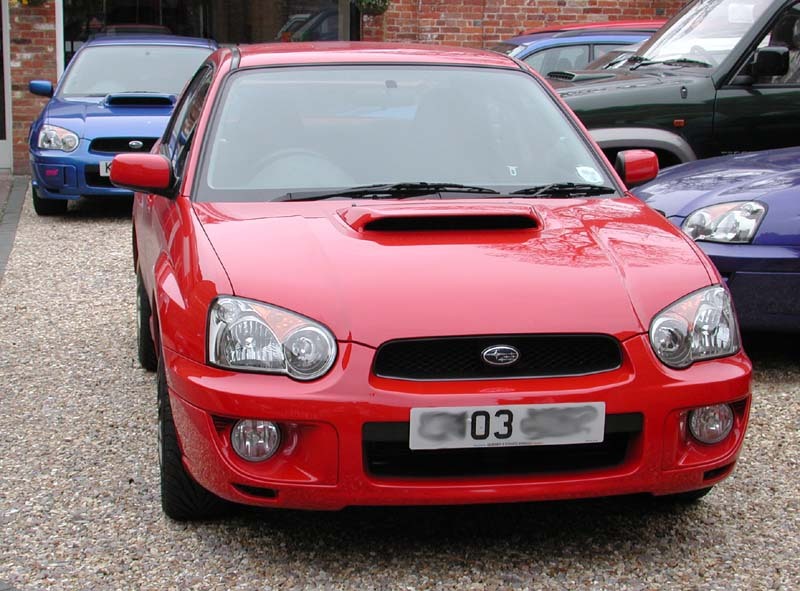 The hood scoop on the WRX has been revised over the MY2002 and is now more aerodynamic. Whether this relates to more air being collected or giving the bulge a bit of style is not known. We took the WRX out first and I was immediately impressed by the flexibility of the engine, and I had only pulled away from the dealership! It is so smooth, and there is usable power very low down. Dribbling through the Baldock traffic was no problem and I was able to be quite lazy and remain in 3rd for most of it. 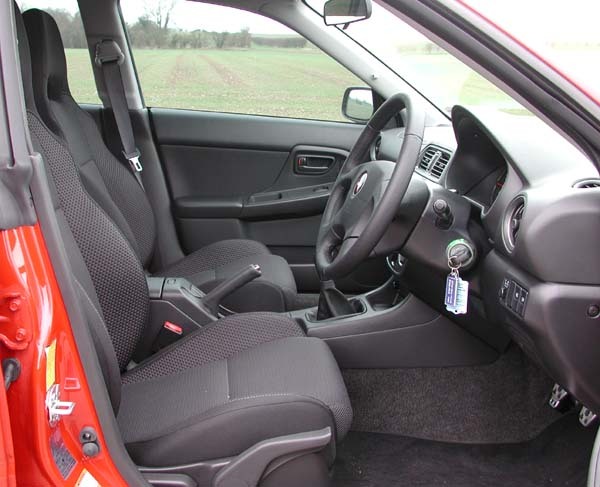 I was not so sure about the side airbag seats though, and they did not give as much support as I would like. 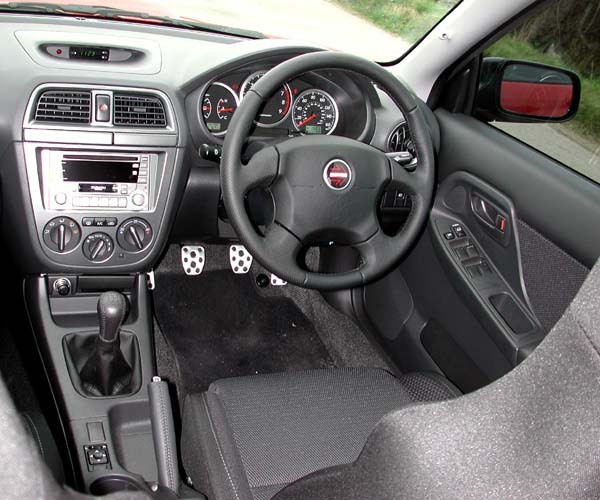 WRX interior, note the side airbag seat and Momo steering wheel. Out into the open countryside the turbo spools up and it brought back the first time I ever drove an Impreza Turbo. The MY03 is a big improvement over the MY01/2 in the way the power is delivered. In fact I would say that it was superior to the UK300 I drove which had PPP fitted. 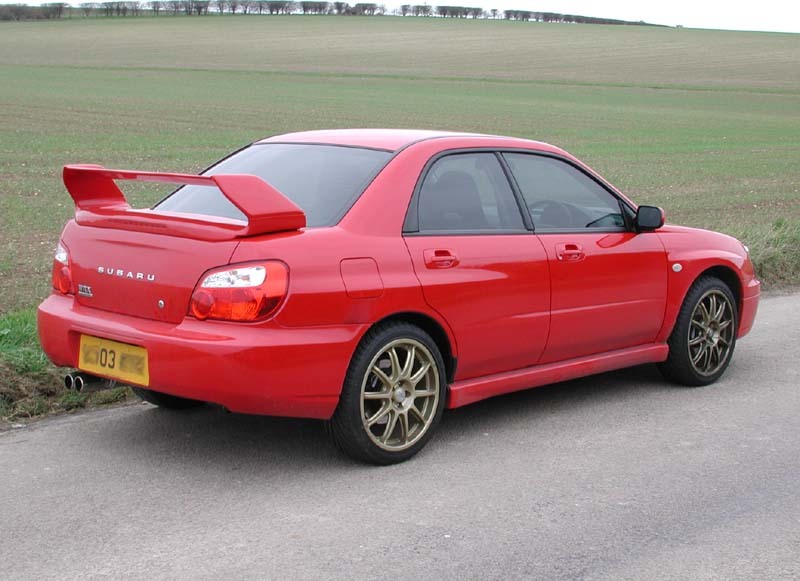 Note that the high rear spoiler and 18in alloys seen here are not standard on the MY2003. Handling was sure footed and it gave the confidence to press on almost immediately, something which has always been strong in the Impreza. 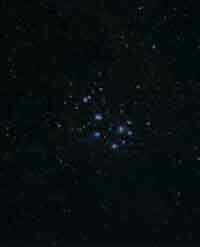 The brakes, as I commented when I first drove the MY01, are fairly severe and need respect. The same 4 pots as fitted to the MY99/2000 but I feel with a bigger servo assistance. Jumping from my P1 there were occasions when I gave the slow down peddle too hard a prod and slowed too much. I did not notice the very light steering I had seen in the MY01 though so perhaps they have detuned that aspect of assistance? The ride was luxury in comparison to my P1 but I did not feel it lacked anything because of it. I found myself thinking I could get used to this and the rest of the test drive was pretty enjoyable. Back at the dealers it was time for the STiUK. The first thing that hits you with regard to the STi is the scoop. 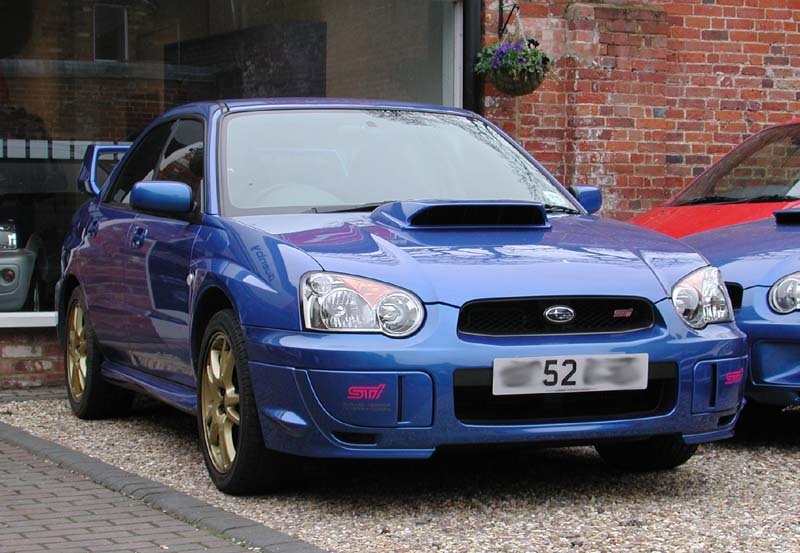 The bonnet mounted intercooler scoop on the STi is a LOT bigger than the WRX and at least one customer has had his arm twisted not to buy the car by his other half due to its proportions. I must admit it is pretty big... ok its HUGE! Forget small dogs and birds...a doberman would disappear in there! From the drivers seat it doesn't disappear either and looks extremely boxlike from this perspective. A word on the rest of the view from the drivers seat. With the restyle, gone are those rounded wings and bonnet, and it's pretty flat in fact...very flat. Almost as if Prodrive didn't have any curve rendering software in their 3D CAD system ;-). 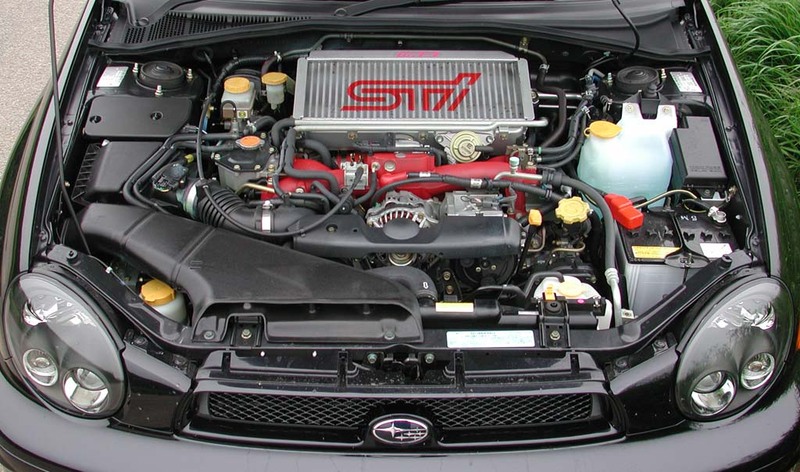 Note the difference in height of the hood scoops and the STi item is very boxy and ugly IMHO. 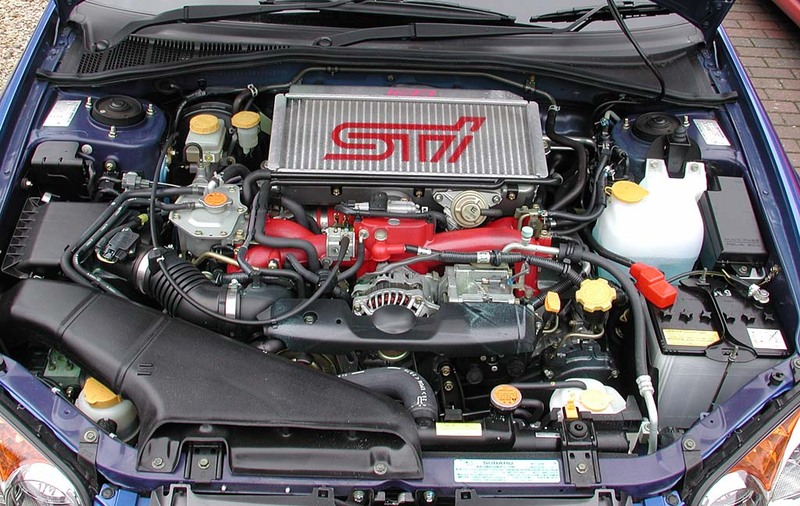 The engine bay inside the STiUK looks near identical to the MY2002 version except for some detail around the top of the airbox and a filler cap just behind the front radiator. Driving the STi along the same high street through the traffic it was apparent that I was driving a very different car. Engine noise was greater, throttle response totally different, and the suspension letting you know every drain cover, pothole etc. The brakes had a lot more feel to them though. I could imagine someone jumping from one to the other thinking that the WRX had better brakes as a lot more pressure is required in the STi. This though translates to better feel. Out on the open road the STi feels pretty similar to the MY02 version I test drove last year. In comparison to the WRX though it does not feel as nice. The ride and handling are superb...but to get the most from it I am having to drive quite hard. As a result, because probably of unfamiliarity, it isn't as enjoyable as the WRX. The power delivery is a lot more peaky and where I was having fun at lower revs in the WRX, I am having to stir the 6 speed box to get the same progress in the STi. Back to Quenbys forecourt and to reflect I am still gob smacked at how well sorted the WRX is in comparison to the STi. If I could have the STi brakes and the gorgeous STi seats in the WRX I would be very happy indeed. 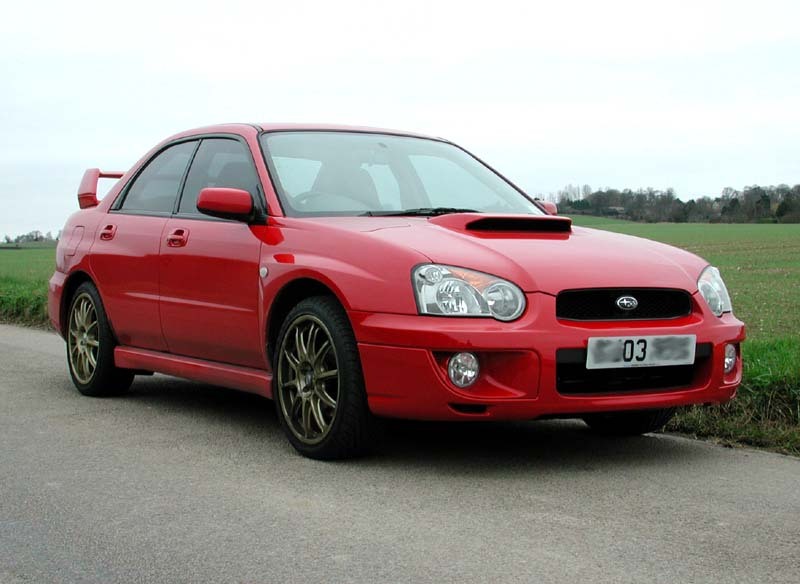 The deal clincher would be that the Prodrive Performance Pack (not tested here) for the WRX puts the power equivalent to the STi and greater on torque figures. 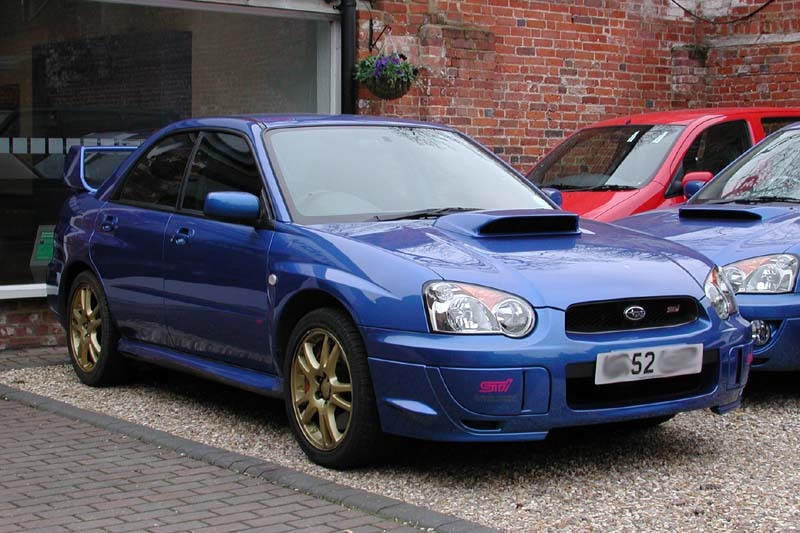 Further more you can not get a 5 door STi. 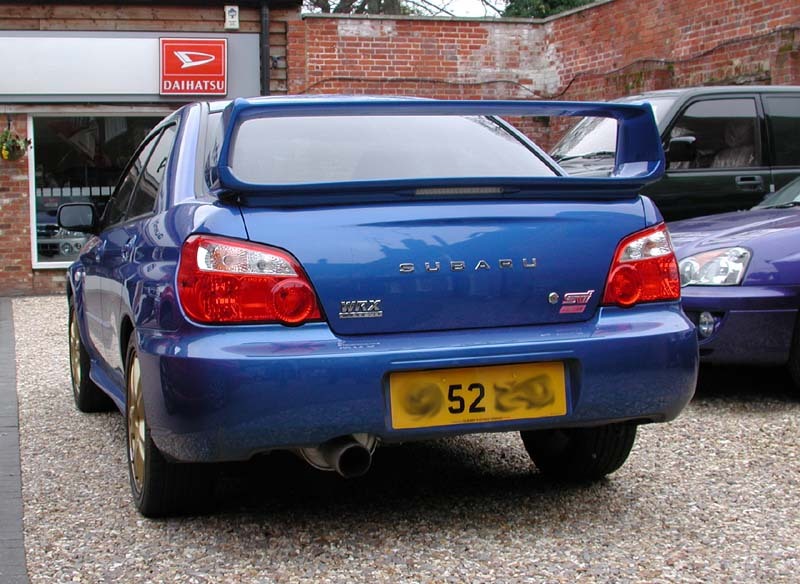 The battle will recommence when both cars are fitted with their respective PPP...until then IMHO its one - nil to the WRX. The MY03 has had a good reception from the buying public and cars have been flowing from the Baldock forecourt. 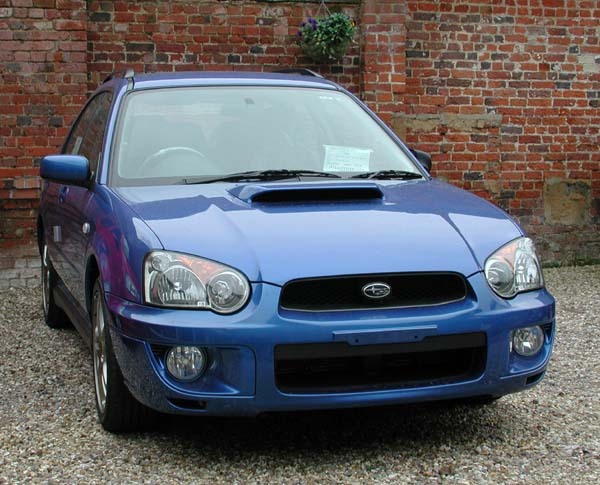 Currently (March 2003) the WRX is on a 2-4 week delivery and the STi on 2 months. All photographs on this page (unless otherwise stated) copyright � Steve Breen and may not be reproduced in anyway without permission.